The Supreme Court today ruled on Northwest, Inc. v. Ginsberg, No. 12-462, denying a frequent flyer’s right to sue Delta for unfairly expelling him from the loyalty program of Northwest Airlines, which later merged with Delta. The suit was brought by Rabbi Binyomin Ginsberg, who qualified for top-tier elite status in Northwest’s WorldPerks program in 2005. But in 2008, Northwest cancelled his WorldPerks membership and withdrew the miles in his account. As justification for the action, Northwest claimed that Ginsberg had abused the airline’s compensation system, logging 24 complaints regarding late baggage arrivals and the like in just eight months. 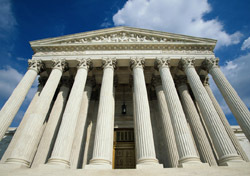 In ruling that that the ADA does indeed preempt claims such as Ginsberg’s, the Supreme Court has likely stanched a flood of complaints from frustrated frequent flyers and reinforced the power differential between airlines and their customers. Do you ever feel that airline passengers can’t catch a break?